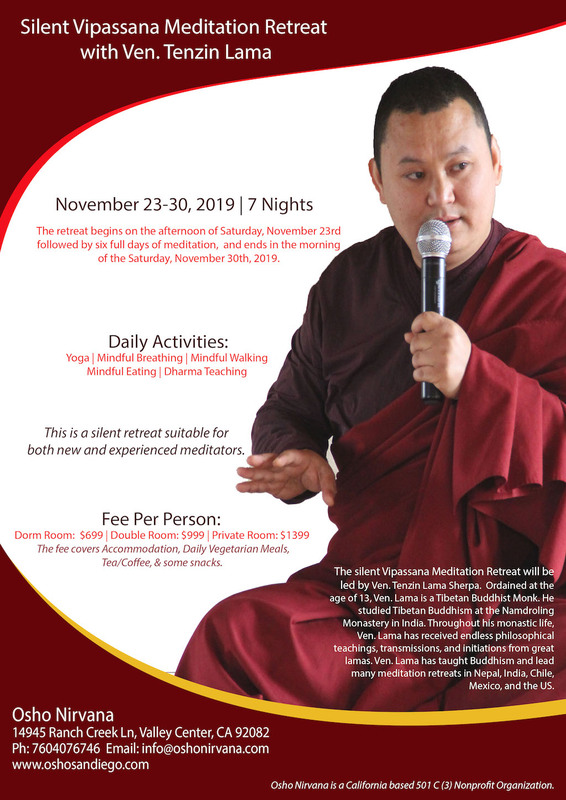 The retreat begins in the afternoon of Saturday, November 23rd, followed by six full days of meditation, and ends in the morning of the Saturday, November 30th, 2019. About the Teacher: The silent Vipassana Meditation Retreat will be led by Ven. Tenzin Lama Sherpa. Ordained at the age of 13, Ven. Lama is a Tibetan Buddhist Monk. He studied Tibetan Buddhism at the Namdroling Monastery in India. Throughout his monastic life, Ven. Lama has received endless philosophical teachings, transmissions, and initiations from great lamas. Ven. Lama has taught Buddhism and lead many meditation retreats in Nepal, India, Chile, Mexico, and the US. The fee covers Shared Accommodation, Daily Vegetarian Meals, Tea/Coffee, & some snacks. This is a silent retreat suitable for both new and experienced meditators. Spaces are Limited – Register here ASAP. Osho Nirvana is a California based 501(c)(3) Non-profit Organization.